Virtual Reality Technology Development Trends | Mentor Works Ltd.
HomeBlogMarket TrendsWhat is Virtual Reality and How Can Canadian Firms Develop It? Virtual reality (VR) is an interactive experience that enables users to interact within a simulated, computer-generated environment. Although it has long been considered a work of science fiction, virtual reality is now more realistic and has practical, valuable uses. Most modern virtual reality systems incorporate the use of head-mounted displays (HMDs) that render high-quality audio and visual stimulation; some systems also incorporate haptics technology, which acts as a controller and gives users greater ability to manipulate their virtual environment. Nearly all major technology-oriented companies are developing virtual reality equipment and environments. In 2016, it was estimated that at least 230 technology companies globally were developing VR-related products. With so much progress happening within the virtual reality space, it’s becoming hard to imagine a world without virtual environments. Not only is virtual reality taking over the gaming and entertainment industry, it also has considerable implications for social sciences and psychology, medicine, and other professions where significant training is required to perform in high-risk, high-stress, and/or high-consequence situations. As virtual reality technologies become affordable to consumers and a wider range of businesses, there will be a considerable shift towards adoption – which will change the world in many ways. Virtual reality has wide-reaching implications for businesses, both developers and end-users. For developers, the beginning of mass-adoption provides ample room to create the systems needed to provide users with seamless virtual experiences. HMDs have progressed substantially in recent years, with companies like Facebook investing in Oculus VR and other companies like Google developing their own proprietary innovations. This has given consumers a wealth of options at multiple price points. Still, there are several ways to improve the hardware devices used for virtual reality, including the addition of more sensory input and features that reduce the risk of health-related side effects. While technology development is still a focal point for hardware companies, there is arguably even greater potential for software companies developing the actual experiences (realities) which users interact with. Software developers will play a key role in the emergence of virtual reality because while great technologies currently exist to provide the platform for virtual reality experiences, there are a lack of environments which enable users to work or play. This is where a lot of the value in virtual reality lies. While it’s essential to have the right technology in place, there needs to be an immersive, valuable experience to be gained by putting on a headset and connecting to another reality. With significant investment flowing into virtual reality hardware and software, even new entrants have the potential to become market leaders in a relatively short time. Let’s not forget that most key players in the virtual reality space are relatively new businesses. Oculus VR, which was acquired by Facebook in 2014, helped bring virtual reality to the forefront of people’s imaginations and made it so that consumer-level VR became a primary focus of other technology firms. Oculus VR was founded in 2010 by an 18-year-old and became synonymous with virtual reality when it raised $2.4 million in its 2012 Kickstarter campaign. To become fully integrated into society, virtual reality still needs considerable development. This includes resolving health and safety-related issues, advancing technologies to make virtual spaces look and feel more like real life, and adapting them for more professional uses. These challenges and opportunities give technology developers a great starting place for identifying how they can contribute to the advancement of VR. There are still a variety of health and safety concerns associated with virtual reality that provide an opportunity for developers. As many as one in 4,000 people may experience symptoms such as seizures, trip-and-fall and collisions, repetitive stress injuries, and interference with medical devices. Most common is eye fatigue; since people tend to blink less when watching screens, their eyes dry out more quickly while wearing an HMD than would happen without. Virtual reality sickness (similar to motion sickness) also occurs in some users. There are conceptual and philosophical implications associated with the use of virtual reality. As virtual realities become more realistic and users have greater control over what happens in these environments, it may become difficult for some to re-integrate into normal reality. This disconnect from reality in favour of existing in virtual settings can have profound impacts on the way we interact as a society. Addressing these concerns is as much an opportunity for technology developers as improving virtual spaces and making the experience more immersive. As virtual reality is adopted by more users – both for personal and professional use – there will be a growing demand for solutions that help overcome VR’s drawbacks. The short- and long-term effects of using virtual reality and augmented reality systems are still relatively unknown; as these technologies become more popular, there must be a focus on lessening negative impacts. Making virtual spaces feel more like reality requires headsets that are ergonomically designed and optimized to provide stunning visuals; audio must be synchronized to real-time actions, and other senses must be incorporated. There are several technologies that must operate together seamlessly to make modern virtual reality systems work, and this provides exciting opportunities for innovative firms who want to contribute to the technology’s growth. Head-Mounted Displays (HMDs): Devices that enable users to access virtual realities have come a long way. With so many developers – including top tech firms – creating new hardware for consumers to purchase, this area is progressing faster than perhaps any other. Still, work can be done to improve how comfortable these headsets feel when being worn, and to reduce the strain they place on users’ eyes to prevent irritation and motion sickness. Haptics: Virtual reality headsets have some functionality in terms of controlling the simulated environment, but handheld controllers provide another layer of interactivity and immersion. Particularly when considering the professional applications of virtual reality like manufacturing and healthcare, users need the ability to manipulate the environment in as many ways as possible. Binaural Audio: Audio, while often integrated with HMDs, is an area that needs more software-supported development. HMDs can give users the sensation of sound originating from different directions, but the range of sounds that can be transmitted is lacking. Sound needs to be a well-integrated feature of the virtual space and connected to user actions, as well as automatically generated based on the setting where a user exists. For example, when walking through a virtual reality forest, users should hear birds chirping or rain falling, as well as the crunch of leaves and sticks under their feet. Omnidirectional Cameras and Photogrammetry: Virtual graphics can be programmed or pieced together from multiple pictures or videos. The introduction of 3D video had significant implications for virtual reality, but the technologies that power 3D video can still be advanced. Deploying more, higher-powered cameras and video devices to record and transmit video is the key to unlocking greater functionalities for picture and photo-based VR. 3D Computer-Generated Graphics: Alternately, developing virtual spaces based purely on a programmer’s vision or use case has room for growth. While most VR developers use C++ as a 3D programming language, this could easily be replaced by other languages that are designed for stunning 3D worlds. Open source programming languages like X3D represent the early stages of this shift, although there’s unlimited potential for virtual reality development if better, more intuitive, easier-to-program languages become available. Education: Virtual reality’s most practical and original use was as an educational device. VR training offers realistic learning experiences while eliminating the real-world consequences of failing, which makes it ideal for military, healthcare, space exploration, and vehicle training modules. Engineering: 3D computer-aided design (CAD) is making it easier than ever before for manufacturers and other industrial users to develop prototypes. Whereas pre-VR engineering required 2D models and paper printouts that require several more steps to develop working prototypes, VR has enabled rapid prototyping with significantly fewer engineers needed. Entertainment: Most consumer-level interest in virtual reality systems comes from its impact on the entertainment sector. Video games, movies, and live performances such as music concerts have all been impacted by the emergence of virtual reality and help audiences feel more connected to the media. By helping consumers feel like a part of the game, movie, or live performance, there is much more value associated with the entertainment medium. Healthcare and Psychology: Because of the positive emotions virtual reality can help its users experience, it has many psychological and physiological uses. So far, VR systems have been developed to support the treatment of Parkinson’s disease and anxiety disorders, reduce the impacts of post-traumatic stress disorder (PTSD), and offer a non-pharmaceutical alternative to pain management. Heritage and Tourism: Virtual tourism is an emerging trend that helps users visit anywhere around the world from the comfort of their home. Virtual realities can be programmed to grant users the ability to travel through cities or even go back in time to visit the recreated versions of ancient societies. Virtual reality is one of several areas that is creating new growth opportunities for software and technology developers. This high-level overview of VR scratches the surface of how much activity there is in the space and the opportunities your company has within it. 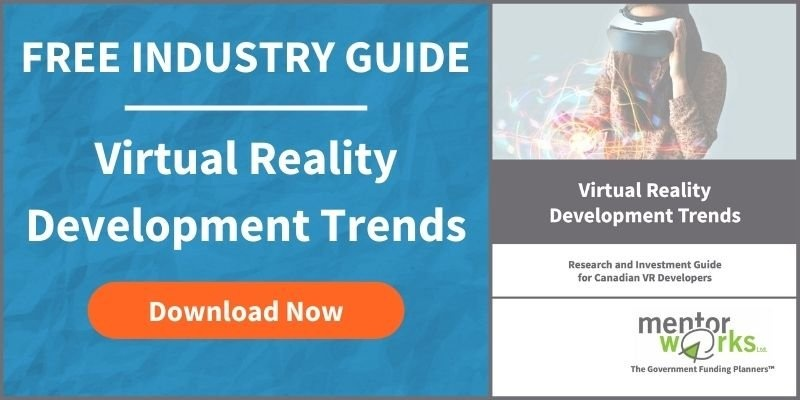 To learn more about how your company can drive innovation in one or more of the VR applications listed above, please download the Virtual Reality Development Trends white paper.